ELI shares its expertise with treatment professionals and students in Romania! Click Here to Learn More. Did you know you can support ELI for FREE by shopping online at Amazon.com? Click Here to Learn More. 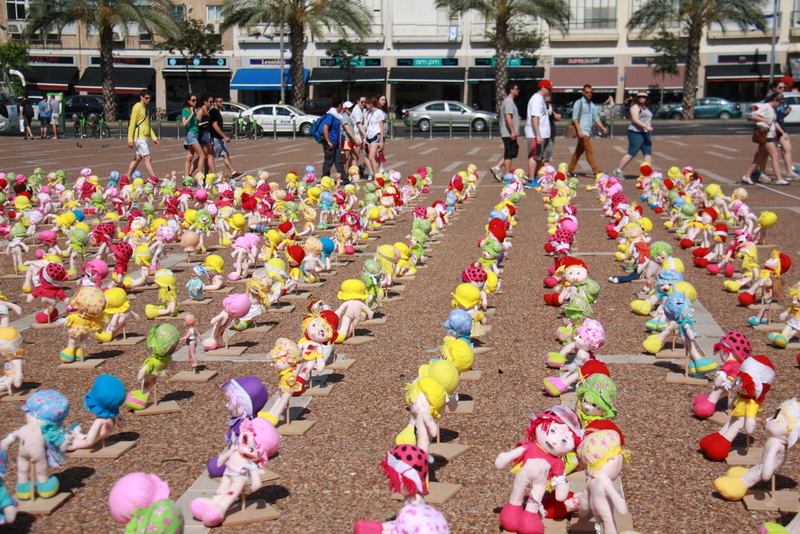 Conceptual art display in the center of Tel Aviv to increase awareness of child abuse. Using puppets, Yael learns the difference between good touch and bad touch. The purple haired fairy teaches children that words can hurt. The Israel Association for Child Protection (ELI) is recognized by the Government of Israel and other human service agencies as the only organization in Israel that deals specifically and exclusively with all of the various aspects of child abuse. The organization works tirelessly to increase awareness of the problem by educating the public at large, by training professionals, by lobbying policy decision makers, and by providing vital information to potential victims and parents – all to enhance ELI’s ability to provide assistance. Emotional scars from abuse are deep and long lasting. Survivors of abuse internalize their pain and lose trust. Working with abused children is a specialty that has been enhanced by ELI therapists, who have the distinct knowledge, experience and ability to help these children and their families. Abuse-focused therapy is the only method available to heal the scars, diminish the pain, and help children regain trust in themselves and others. At the same time, ELI works with both victims and perpetrators, and siblings, other parents and extended family members. This comprehensive approach is the hallmark of ELI.